In June 1949 Winnie sent a postcard from Ramsgate in Kent to friends in London. In September 1962 an unmarried woman received this colourful postcard of Piccadilly Gardens in Manchester from a male friend. Here I am in the middle of the Derbyshire Moors, very flat and featureless on top but deep, steep sided valleys are fairly impressive. I came out here for a breath of fresh air, Manchester is oppressive; the top of the moor really is unbelievably flat, and certainly doesn’t reward the climb. Last term I ran a short course for adult learners called ‘Tourist London Since 1800’ at Bishopsgate Institute. As with all the courses I deliver, I selected a range of original sources from the Institute’s library and archive collections to direct the learning process and each week students explored a different theme using tourist guidebooks, restaurant guides, and so on. The final week’s theme was ‘Nights Out in London’. As I gathered materials for the session, I stumbled upon this slim pamphlet. This was an item I hadn’t seen before. Attracted by the cute jester on the front cover, and overlooking the rather dog-eared appearance otherwise, I popped the pamphlet on to the top of a set of materials on pubs, clubs and dining out at the very last minute – and started to deliver the class without having looked inside this one item. Honestly, this is not how I usually plan my sessions. The notes read: “You don’t shay sho” “glad eye” “Oh how I wish Mother was here”. As the group started to explore the sets of archive materials laid out for them, one student called me over to share an incredible find. On every page of ‘Tabarin Club’ someone had annotated the illustrations with droll remarks. With the kind permission of Bishopsgate Institute, I’ve reproduced this fabulously acerbic set of marginalia here for your enjoyment over the bank holiday weekend. These scribbled lines smartly undermine the formal, almost pompous, tone of the printed content that outlines the facilities offered at the Tabarin Club (‘special care has been given to the proper ventilation to ensure a refreshing and invigorating atmosphere…’). They also offer insight into popular catchphrases and comic conventions of the 1920s. Here we have: “Someone has pushed him in the neck” “Booking up Vacant Dates” “I don’t care for you! !” “Frank with Bird and headache”. I would like to thank my eagle-eyed student Jacqui Ross for bringing these previously overlooked notes to my attention – and now also to yours. As is often the case with original historical sources, this item asks more questions than it answers. Most obviously, who wrote the comments? Were they based on personal experience of nights out at the Tabarin Club (“why do we do this?” “you’re not going home yet sweetie…”)? 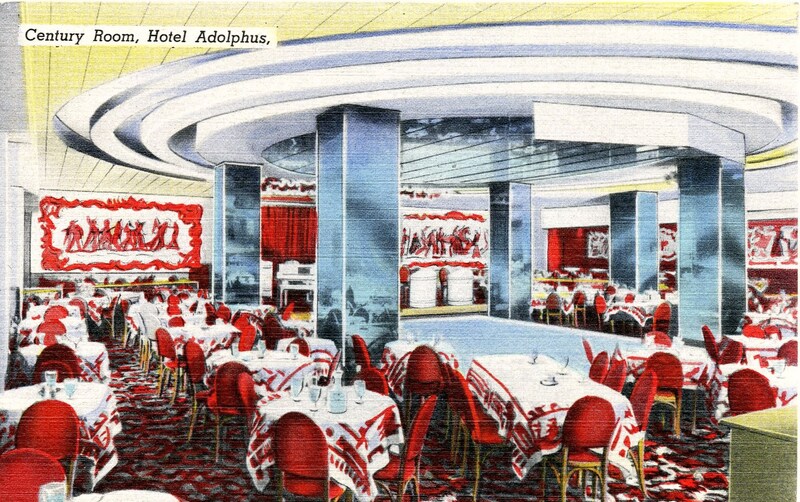 And what else can we discover about the Tabarin Club? Street directories from the 1920s give the club’s stated address of 31 Tottenham Court Road as the Rector’s Club rather than the Tabarin. Yet the production of a high quality brochure of this type suggests a degree of permanence or longevity as opposed to a short-lived residency. This useful website mentions the Tabarin in the body of a longer piece of writing on London’s interwar jazz clubs but otherwise I’ve been unable to find out more about the club. Anyone able to provide fresh insight is invited to comment below. Similarly, anyone wishing to get their hands on this and dozens of other original sources on the history of ‘London at Play’ is encouraged to sign up for my next archives-based course at Bishopsgate Institute, starting on Monday 9 May. This annotated pamphlet will also be featured in a session delivered as part of Duckie’s Quite a Lot of Balls weekender on 7-8 May. From ‘All About the Diamond Jubilee’ (1897). (2) In January 1894, the City Press reported that more than 40 Liverpool Street station staff had been successfully examined in the principles of first aid. (3) In 1851,’ due care and attention’ was paid to the load-bearing capacity of the new gallery flooring ahead of the public opening of the Great Exhibition in a purpose-built Crystal Palace in Hyde Park. 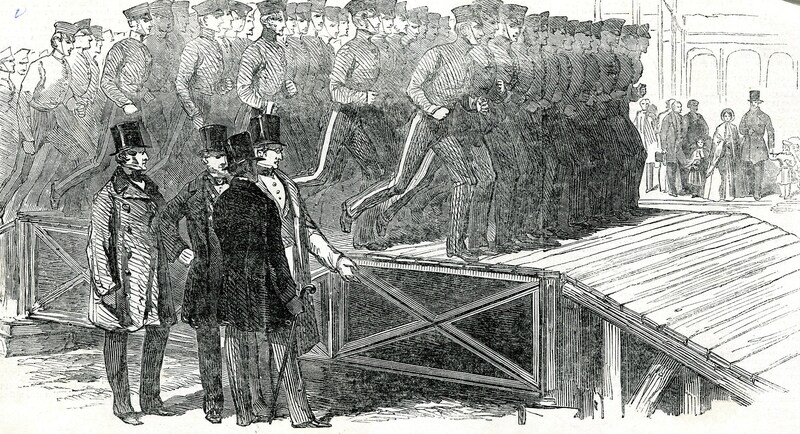 From the Illustrated London News, 1 March 1851. Reproduced with permission of Bishopsgate Institute and Archive. (4) In 1893, the architect employed to design the new Bishopsgate Institute and Library implemented structural safety measures to facilitate prompt evacuation of large numbers of people from the lecture hall in the event of a fire. 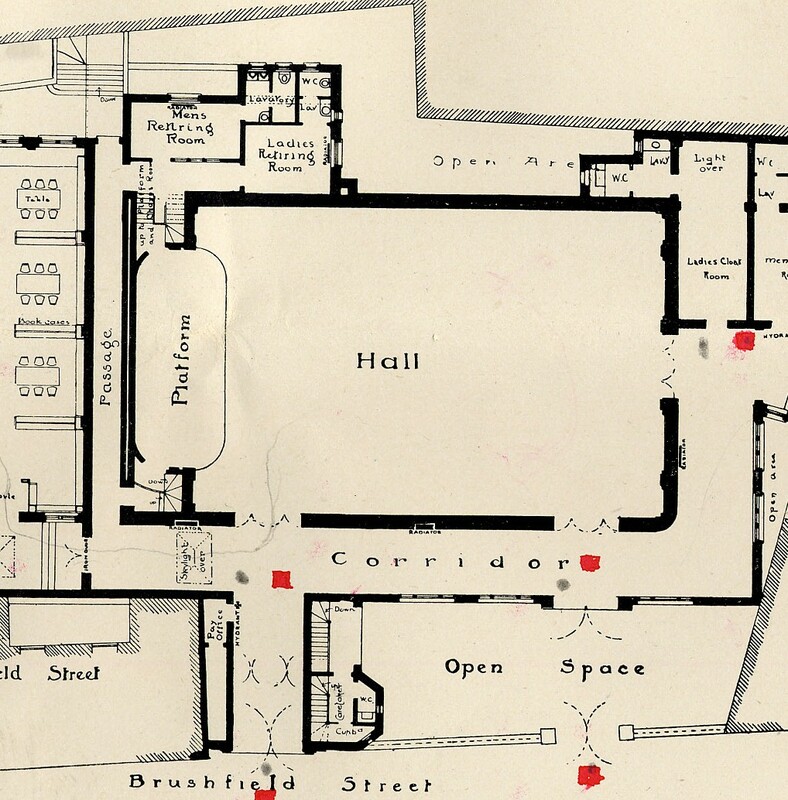 Detail of Bishopsgate Institute ground floor plan (1893), showing that hall exit doors were positioned to enable direct access out to the street. Reproduced with permission of Bishopsgate Institute and Archive. A more systematic overview of the history of health and safety legislation is available here. In August 1906 Alfred ‘Alf’ Leicester visited London from Bridgwater in Somerset with his friend (also called Alf). 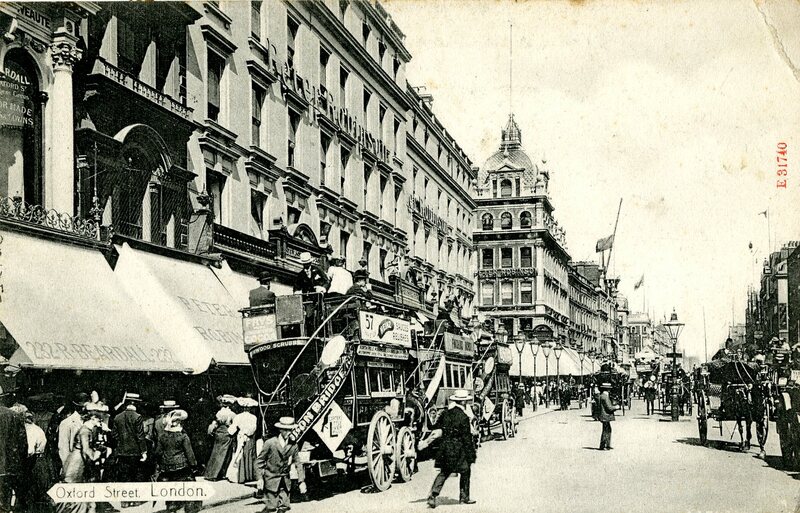 On 21 August he sent this picture postcard of Oxford Street home to his sister. Only a few days now…!! The stamp affixed to the back of the card reminds us that World War Two had only recently ended in Europe. ‘I’m just dining here – good food as things go but I’ll be mighty glad to have again such as you can provide. Only a few days now…!! 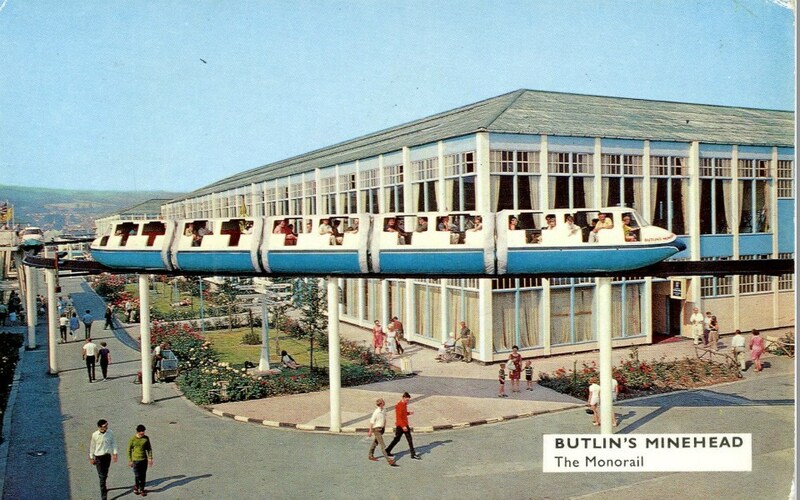 Love R.
In July 1973 Laurence went on holiday to Butlin’s at Minehead in Somerset with his family. He sent this picture postcard to his friend Dave. Having a super time. Yesterday I had a game of snooker with my dad and I potted 5 balls. Today I might go on the chair lift with my dad. I can’t go on with my sister cos she’s too chicken.